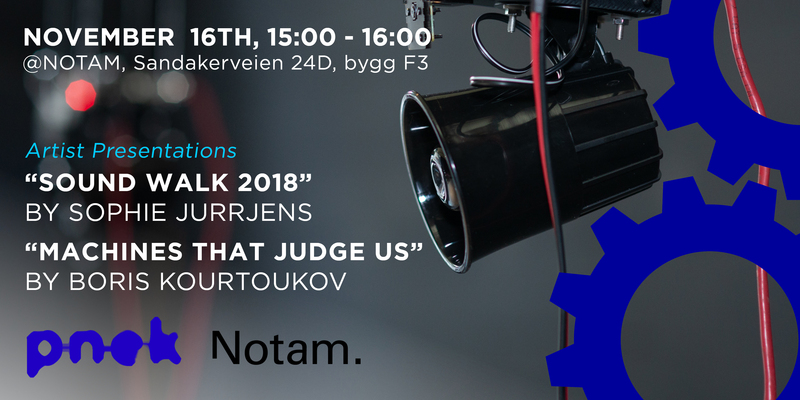 NOTAM and PNEK invites you to artist presentations by Dutch artist Sophie Jurrjens, who will present her work «Sound Walk 2018», and Boris Kourtoukov talking about his project «Machines that Judge Us». Both works works were developed as part of the Summer Sessions Residency at V2_, Rotterdam in 2018. Kourtoukov was the selected artist by PNEK to develop his work at V2_, while Jurrjens was partly hosted at PNEK/Notam. How do music and the landscape influence each other? This is the central question in Sophie Jurrjens’ work and life. Through composing music for specific locations, she transforms the experience of going for a walk. The Off-Track app invites urban millennials to go outside and experience their surroundings in a unique new way. The piece has been specially designed to detect the user’s location and connect it with a corresponding piece of music. Every walk therefore creates a distinct reality, inspiring the user’s imagination and emotions through sound. Off-Track aims to reduce stress and burnout symptoms in the urban millennial’s life.